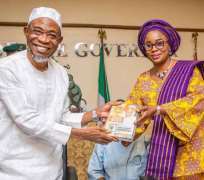 The Governor of Osun State, Ogbeni Rauf Aregbesola, has reiterated his commitment towards making tourism a money spinning venture. He said his government would not relent at making ecotourism accessible to tourists all over the world in order to boost the economy of the host communities and the state in general. Aregbesola who was represented by the Special Adviser to the Governor on Culture and Tourism, Mrs Taiwo Oluga, made this remarks at Erin-Ijesa during the flags off ceremony of access road to Olumirin Water Falls. The Governor explained that provision of access road across the tourist sites in the state has been the focus of his administration, noting that the initiative has gone a long wayin boosting the sector. According to the Governor, accessible road remains a major criterion for consideration before a tourist site could be recognized for visitation. ‎"And when the road is completed, a lot of unimaginable transformation will definitely come to Erin-Ijesa and its environment as this gesture would further enhance the socio-economic and cultural-tourism activities in the state. "However, the construction of this access road would lessen the avoidable stress of accessing our potential at this site and as well making the tourists adventure more comfortable. "Also the construction of pedestrian bridge would help to ease the ascension and dissension of tourists and aesthetics as this will further attract more visitors and researchers." The Governor said this is happening at a time when MKO Abiola International Airport, Ido-Osun is being put in place thereby‎ making the arrival of tourists to Olumirin Water Falls from around the world an easy one. He also thanked the management of International Breweries‎ Plc, Ilesa for the construction of Garden Parks at the site as part of her Corporate Social Responsibility while appealing to the people to pay their taxes and other levies, so as to make government provide‎ more infrastructural development to the state. Also speaking, Chairman Osun State House of Assembly House Committee on Home Affairs, Tourism and Culture, Hon. Olasunkanmi Akinola, Chairman House Committee on Finance and Appropriation, Hon. Kamil Oyedele and Hon. Israel Aloba, appreciated the government's‎ gesture and appealed for the continued support for Aregbesola's administration. Assuring the state of quality delivery, the Project Coordinator, Office of Water Resources, Rural Development and Community Affairs, Engr.‎ Adelere Oriolowo, said the intervention of the RAMP which is to make life meaningful to rural dwellers has impacted positively in Osun through the commitment of Mr Governor, Ogbeni Rauf Aregbesola. He then assured all that the road wouls be completed by January, 2018 and that all‎ bridges would be done to standard with asphaltic lane. Commending Aregbesola for being committed to infrastructure development, the host traditional ruler, Oba Isaac Adeyeba Ayeni, Okin Oloro 2nd of Erin -Ijesa who was visibly happy, thanked the Aregbesola for his support and commitment to making Olumirin Water Falls the desired place for every tourist. He‎ therefore appealed to the government, to provide security post and health centre along the site for the safety of visiting tourists.